The NO PROBLEM credo is simple: all problems are solvable – those that aren’t are decisions or dilemmas. Once you understand this and know what to do about it, you too will say NO PROBLEM and mean it! 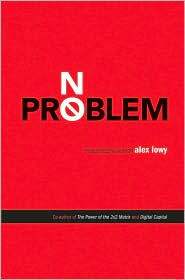 Don Tapscott says, “Alex Lowy is a master problem solver, and when you read this book you’ll understand why. NO PROBLEM unpacks the mystery of how problems differ, and illustrates how people unwittingly get in their own way. Do yourself a favor and read it now.” Don Tapscott, Chief Executive, New Paradigm and co-author of Wikinomics: How Mass Collaboration Changes Everything. 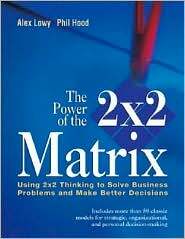 The Power of the 2 x 2 Matrix is a gold mine of ideas and tools for the business problem solver. Draw from the book’s collection of 55 outstanding frameworks applied by leading business thinkers such as Michael Porter, Stephen Covey, and Igor Ansoff. These tested frameworks will help you tackle the thorniest of issues and learn how to apply 2 x 2 Thinking–the strategic orientation of the most successful and innovative problem solvers.